At Villa Vallerosa. Students continue work on the well house, with a representation of the Greek myth of Arion. The project took place over two weekends with two giornate, despite some bad weather. at Villa Vallerosa. Students resurface and paint the central motif of the well house, depicting a stone mask based on Roman grotesques. 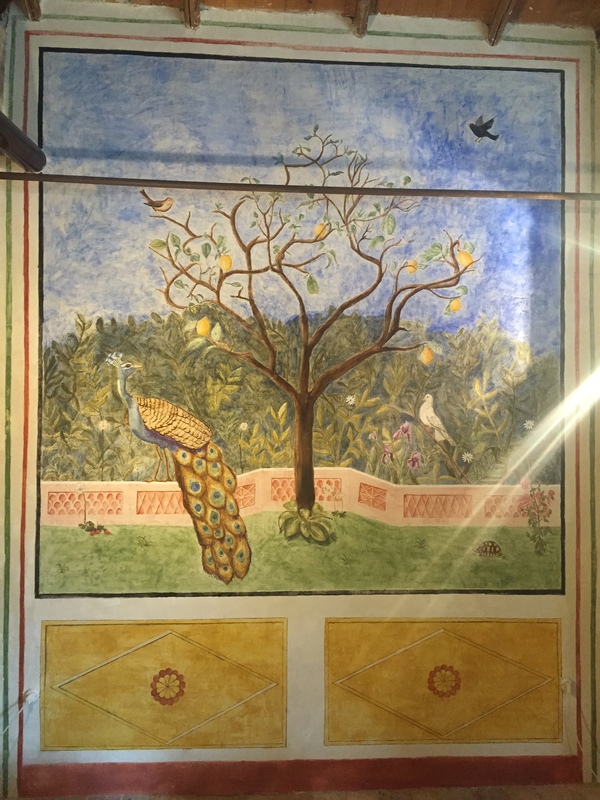 As part of their coursework, Temple University Rome students completed a fresco at Villa Vallerosa in Selci Sabino. The three day project involved redecorating an 18th century well house on the property. The fresco incorporates different aspects of fresco painting in Roman churches and museums, including faux marble. The central panel features the goddess of hospitality, Ebe, after a sculpture by Canova. Through a special course developed by Professors Candice Smith Corby and Maria Curtin at Stonehill College called Artist, Craftsman, Alchemist, students learn about ancient materials and painting techniques such as watercolor pigments, egg tempera, and encaustic. 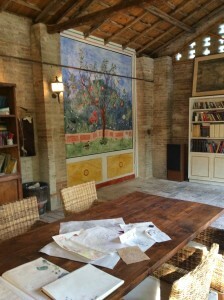 The course finishes in Italy with an on-site fresco workshop with Professor William Pettit. At Villa Vallerosa, Selci Sabino, Italy. This year, as in 2014, we followed the model of the frescoes in Villa di Livia, varying the flora and fauna to reflect local species. Around a lemon tree we chose to peacock, symbol of the afterlife in Roman iconography, as seen in our Vatican scavi tour. The workshop took place over 10 days and included several visits to see fresco paintings in Rome and in the Sabina, as well as the usual fresco execution at Villa Vallerosa. The fresco took three giornate over seven days. Besides the initial arriccio, each giornata consisted of two layers of mortar and painting. In Rome, site visits included frescoes at San Clemente, Sant’Ignazio, and Villa Massimo. We sampled typical Roman cuisine in the Ghetto including fried brains and tripe. Local visits in Sabina included San Cataldo in Cottanello, Santa Caterina in Roccantica and Santa Maria del Vescovio with Prof. Larry Welborn, professor of theology at Fordham University. At the final presentation of the completed fresco, students celebrate their hard work with an aperitivo and the many guests from near and far. The fresco is visible at Villa Vallerosa, in Selci, and will be for the next two thousand years! Special thanks to Luciana Pancera, the Comune of Roccantica, Luigi Colletti and the Comune of Cottanello, and Prof. Larry Welborn of Fordham University. The fresco was completed in the true fresco style in three layers using slaked lime, river sand, and Carrara marble. As always we use only traditional earth pigments to ensure longevity. This fresco is based on the garden scenes in the Roman frescoes of Villa di Livia. The idea was to include local flora and fauna and the symbolic pomegranate tree in the center. The abundance of laurel and the white chicken and directly inspired by the Villa di Livia frescoes. Students worked on studies of local plants and prepared cartoons to trace. There are a variety of local plants and birds. The wall, 250 by 350 cm, was executed in two giornate. Due to the favorable weather, our painting time was prolonged to about 24 hours, allowing us time to work on details. The wall involved about 600kg of slaked lime, 800 kg of river sand, and 50 kg of marble dust and five days intensive work for the ten students. The workshop was supplemented with visits to nearby villas and churches to understand how fresco functioned throughout history. Congratulations go to the students for their excellent work, cooperation, and dedication. Special thanks to Luciana Pancera for the hospitality.